Street parking in front of the restaurant or a parking garage located right next to Yoshi. There are 2 levels of retail parking. 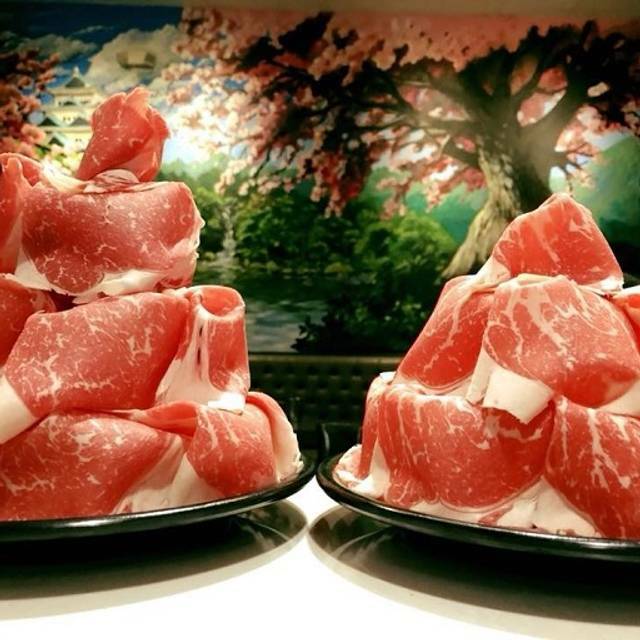 Yoshi Shabu Shabu is a traditional Japanese dining experience. We cook the finest natural meats and vegetables in a simmering broth at the table. We are also vegetarian friendly. We offer 3 amazing authentic Japanese dipping sauces Sesame Peanut (Goma), Citrus Ponzu, & Sweet Garlic Teriyaki. 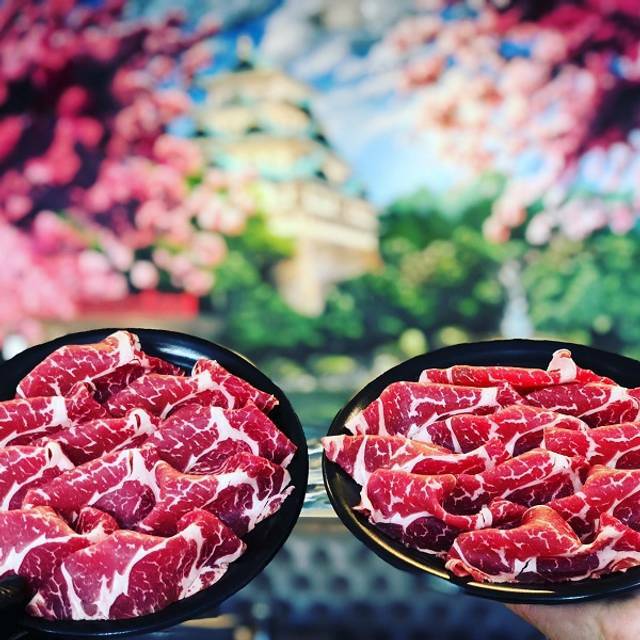 Our grass fed ribeye beef is sliced on a slicer right in front of the guests and cut fresh to order. We also offer various types of meat & seafood. 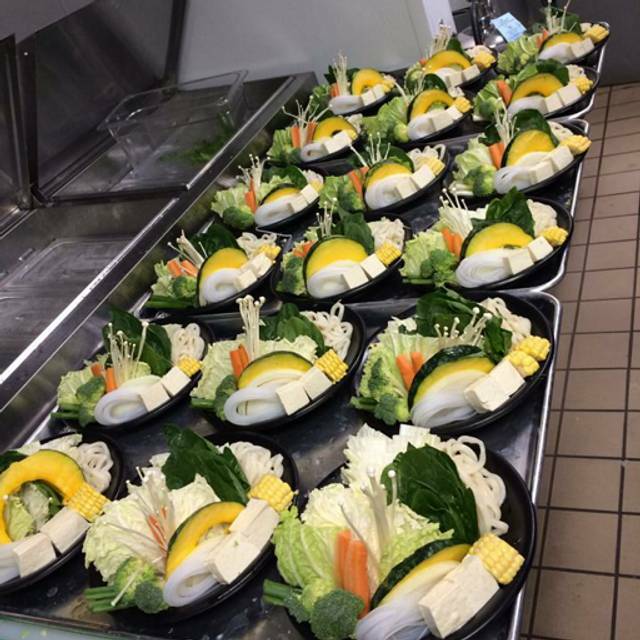 Here at Yoshi, we will always serve you the freshest, natural and most delicious ingredients! We would love to welcome you to our unique healthy dinning experience. All orders are served with 1 seasonal assorted vegetables, 1 noodle choice and, white or brown rice and 3 dipping sauces. Customize your Veggie plate at no additional cost. Go Big sizes Yoshi, Donkey Kong, King Kong, Godzilla come with 2 vegetable plates, 2 noodles, and 2 rice/sauce sets. +$3 prime + $8 wagyu. 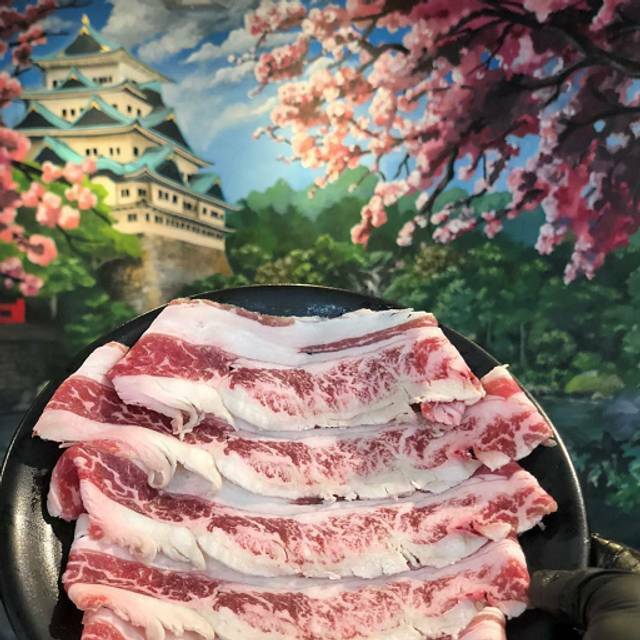 Pick any proteins form: Choice Beef Ribeye, Prime Beef Ribeye, Wagyu Beef Ribeye, Berkshire Pork, Chicken Breast, Shrimp, Green Mussels, Scottish Salmon (Sushi Grade), Jumbo Scallops. Also Available for on the Go! Goma Sesame Peanut: Add: Garlic, Green Onions, Rayu (mild red oil) & Ichimi (red pepper). Citrus Ponzu (tangy & sweet): Add: Garlic, Green Onions, Daikon (flavorless radish for texture), Rayu (mild red oil) & Ichimi (red pepper). Roasted Garlic Teriyaki: Add: Green onions. Like it Hot? Add rayu oil & ichimi pepper for that extra kick! Want it Extra spicy? Ask your server for our spicy specialties! Come enjoy amazing happy hour with us!!!!! $3 mimosas, $4 Sangrias, all apps. Come have fun and eat great food. Great Apps, Beer, Sake, Wine Specials. Enjoy $3 Draft pints of kirin, sapporo, Asahi. and amazing sake and wine specials. All apps are also on happy hour. I LOVE LOVE LOVE this restaurant. The food is always top notch and the interactive nature is just fun....also you have to try the watermelon iced tea. It is fantastic. Always a unique and delicious dining experience. It’s our favorite ‘special family dinner’ place to go! If you haven't tried this place, you must. We go once a week and love everything about it. What a terrific place! Super friendly and helpful staff, great food, and a fun way to enjoy dinner with friends! Highly recommended! 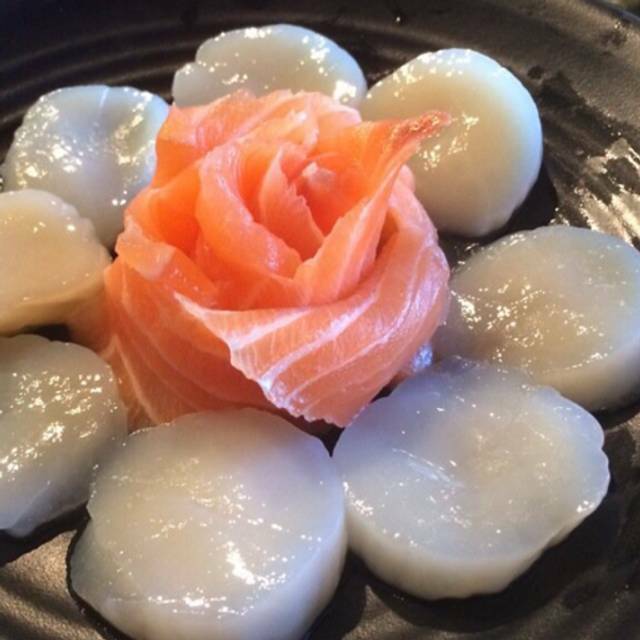 Shabu Shabu is an amazing restaurant! Loved everything about it! 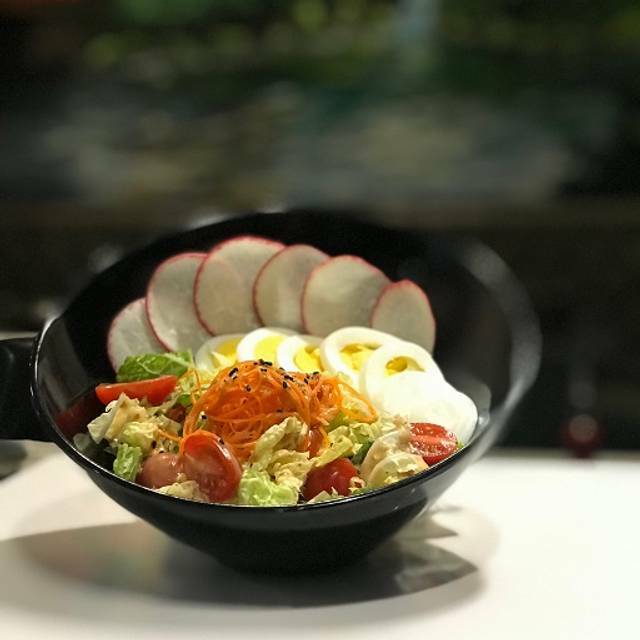 The entire experience was awesome, but the top 3 memorable things were the excellent service, the food quality and the clean comfortable atmosphere. I have been several times now and I have never been disappointed. This is now my favorite place to take friends and family...and everyone I've taken has been very impressed and loved the experience. Thanks for being a restaurant that I can trust to never disappoint! We loved it! Went there for my birthday. The servers explained everything and went over all aspects of the menu. They helped us prepare all of the food since it was our first time. Everything was so delicious omg! I loved the unlimited rice and sauces and the noodle soup at the end. I think the meats are a little overpriced but overall an awesome place and experience. Good for parties up to 6. Very fun night out with great happy hour specials and excellent food with high quality ingredients. Pretty good gem to try out! Menu was slightly confusing but waiters were patient and attentive. Love the food!!! We had a reservation, but had to wait a bit to be seated. They put us at the bar although we thought we might get a table for a reservation. The waiter kept forgetting to bring us the courses— we had to remind them. It takes a while to eat Shabu Shabu, but we were there an hour and 45 minutes since the service was spotty. However, the servers were very friendly. Excited that they may open one in Uptown!!! The dinner was a fun and easy immersive experience into the world of traditional Japanese Hot Pot. We had a blast and will be going back for more! Our first time here from out of town. We were treated like royalty, and everything about it was superb. A little pricey, but it was legitimized by the excellent service. I gave 4 stars for ambiance, as there needs to be some separation between the first table and the entrance. As diners arrive and wait to be seated, they hover around very close to your table, eyeing your food, watching the production, etc. Would've been nice to have just a touch more privacy. We love this place and crave it once a week. The experience is always great and that is why we go back and bring friends and family to try it also. Despite having a reservation and there being several open tables, we were made to wait 20 minutes for our table. The food was decent but not great. The best word to describe the atmosphere is “cluttered”. The restaurant also did not feel super clean. We will not be coming back. I would recommend this place.. service was pretty good. Not as good as they have been in the past... There were a few take aways that they could use, bring small plates for the food after it comes out of the hot pot.. there is nowhere to put it besides the rice bowl, Also make sure you know what sauces you are putting in the bowls. Let people know when something is extra... for instance the egg at the end... with the soup is now.. extra, that should be communicated to the guest. This is an interactive meal; you get to cook your food, then eat a secondary meal that you created from cooking the meat and veggies. It was nice in terms of service. The environment is nice but it's not something I want to have for dinner. The place does not have appropriate solution for the humidity from the steam. I ordered Sukiyaki. Had to order 3 more times of the soup base, it took such a long time to boil. it wasn't pre boiled hot broth like you would find in Korean restaurants. Takes a long time to eat here so be planned for like 1.5 to 2 hours meal here. I was sat down immediately after arriving. The server was both attentive and knowledgeable without being overbearing. The experience was fun. The food was fantastic! I will definitely be going back and recommend to friends. This was one of the best restaurants my boyfriend and I have ever been to. We’re both huge foodies and this was an absolute delight. The produce and meat were top quality and the staff were very helpful and friendly. 10/10 would hella recommend. A coworker told me about this restaurant and I was so excited to try. I had never been to a hot pot restaurant. My husband is always skeptical to try new restaurants but we both enjoyed our dinner very much. There’s nothing special about the ambiance but I appreciated seeing the meat being cut for everyone to see. Everything was fresh! We left feeling full and had leftover soup for the next day. Two thumbs up!! Yoshi Shabu Shabu is really fun and great fresh food. It's kind of like Japanese version of fondue but instead of cheese you cook your food in a healthy yummy broth. The meat is prime and grass fed; salmon is sushi grade. Of course, prices match the quality. ;-) Lots of veggies. It may be a bit overwhelming at first but once you have it down, it's a great, fun experience. Staff is very willing to help explain everything. First time experience was amazing. Walked all through different broths, meats and the veggie plate was really well decorated and delicious. The price was definitely high. About 30-32 a person it comes out to be about on average. Definitely worth it for the experience. Also got free ice cream because birthday :) which was also delicious! Went for my husband’s birthday. Great service and fun experience! It’s an amazing experience with excel food. Every bite is hot and fresh and the staff is super helpful. Loved Yoshi Shabu Shabu, will definitely be back! Met our son and girlfriend here for dinner. They were about 20 minutes late but no big deal because we ordered drinks since we were early for our Sunday reservation...except that the waiter kept forgetting our drink orders. Food was fresh and tasty but our waiter was very slow and this type of eating is slower because you cook for yourself and everyone cooks for varying times. That being said, we enjoyed our dinner. What made our dinner disappointing, besides the slow and forgetful waiter was that after we finished, we sat talking for about 10 to 15 minutes as we waited for the bathroom and just chatting. Then the waiter came up to us and said they needed our table due to the wait. Okay, but seriously we had a reservation(on a Sunday at 6), we were delayed partly due to our son and partly due to the waiter, we had an expensive bill because of course we had drinks, appetizers and no sharing of meals and you basically ask us to leave. Very disappointed. We won’t be back. Always a great experience! Love the food and service! 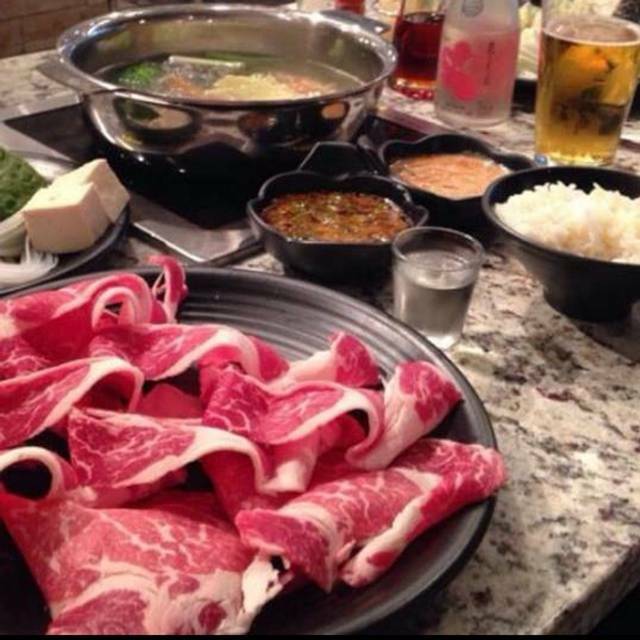 Hands down best shabu shabu I've found in Dallas. They know how to put it together with great meat and vegetables plus perfect sauces. 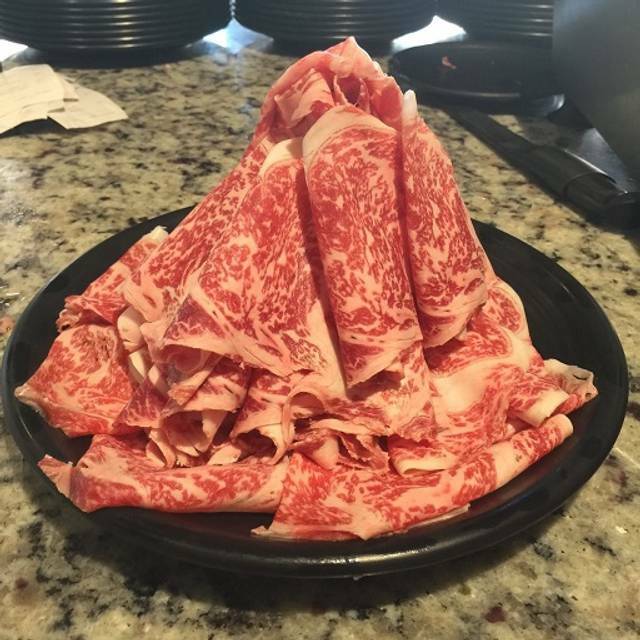 Spent years in LA and they bring the best of King Shabu Shabu here. Always a perfect meal. This place is absolutely amazing every time. I especially love bringing people here for the first time since it is such a unique experience!! Never fails to impress! Love this place, great for a date or just quality time with friends or family. 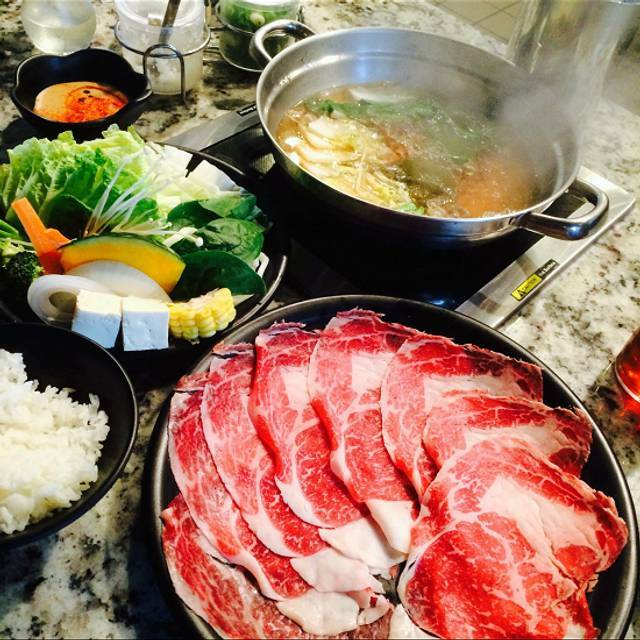 Fresh & delicious Shabu! Japanese fondue style dinner and it is so fun and outstanding!!! Great food and a fun interactive meal with friend! Very unique Asian dining experience. I consider myself well versed with Asian food but this was a new one for me. The staff were very friendly and helpful in explaining the process which made for a great first time visit. A little pricey but what isn’t anymore. I will definitely be back. The restaurant did not honor our TABLlE reservation. There was a table available but we weee told it for someone else who was not there. Does the restaurant honor Open Table reservations! Very disappointed and felt the man at desk was not helpful. Always a pleasure-- great food, great service. ALWAYS. Took our daughter and her SO on XMAS Eve. They had not been before. It was a very fun evening with excellent food. So fresh and delicious. Amazing fresh food. Love this place! The food is so fresh and you practically cook it yourself. Great service too.